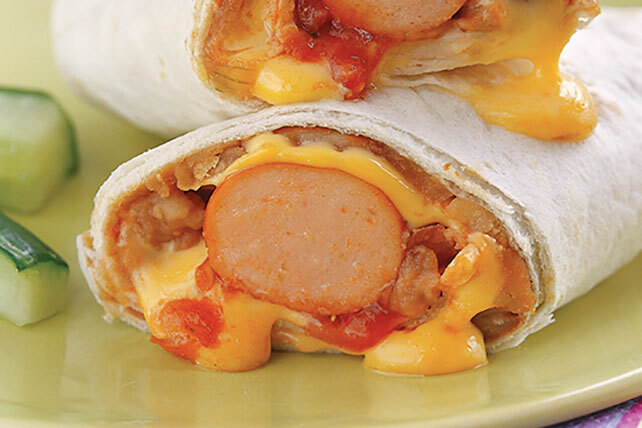 Salsa, cheese and refried beans are wrapped up in tortillas with hot dogs in this tasty take on burritos. Cook wieners as directed on package. Spread tortillas with beans; top with Singles, wieners and salsa. Roll up. Wrap individually in paper towels. Microwave, 5 at a time, on microwaveable plate on HIGH 1-1/2 to 2 min. or until Singles are melted. Save 60 calories and 9g of fat, including 3g of saturated fat, per serving by preparing with OSCAR MAYER Light Wieners, TACO BELL® 99% Fat Free Refried Beans and KRAFT 2% Milk Singles. Enjoy these fun hot dog treats, but remember to stick to the serving size.